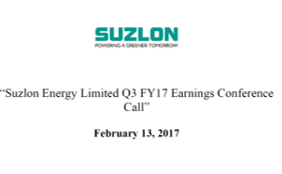 In Q3, consolidated revenue is Rs3,307 crores that is 20% up on quarter-on-quarter basis and 76% up on year-on-year basis. EBITDA is Rs. 1,502 crores that is 70% up on Y-o-Y basis. Net profit of Rs.296 crores in nine months. 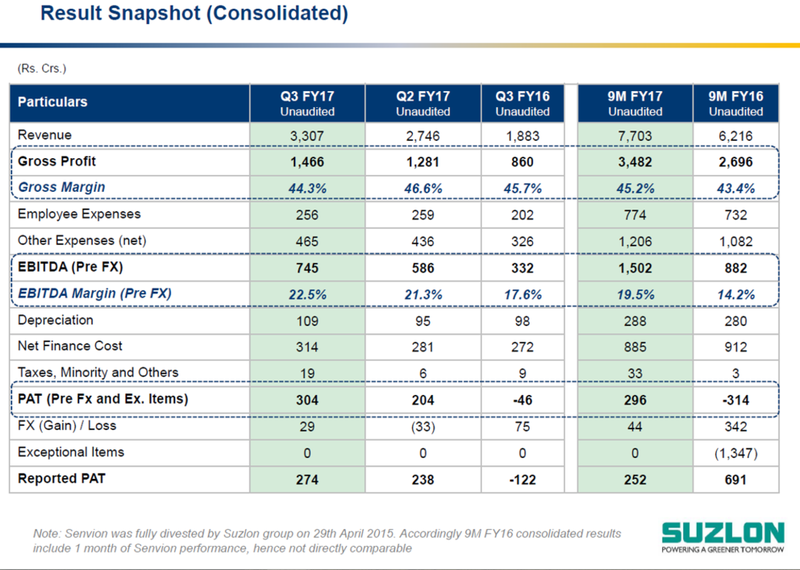 Net finance cost increased in this quarter by Rs. 33 crores primarily due to temporary increase in working capital usage for volume rampup. CARE Rating has upgraded Suzlon and its domestic subsidiaries as well as SE Forge credit rating from BBB- to BBB. The plant load factor of the solar is 18% to 20%. 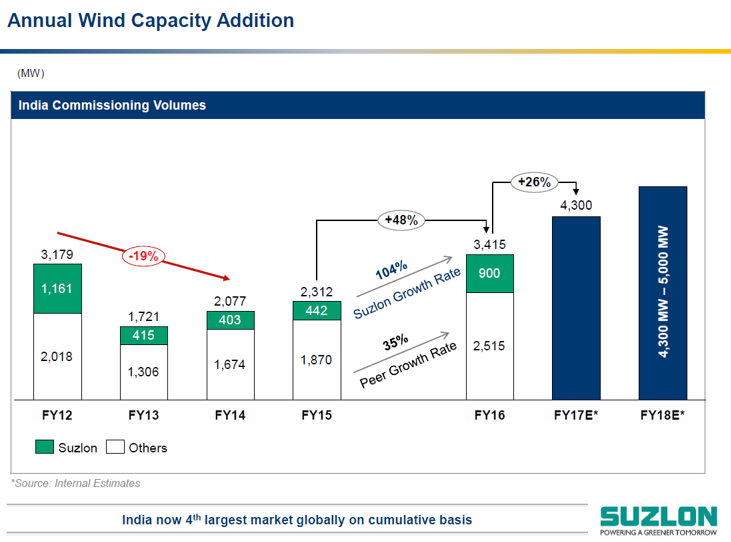 The country rate of interest reduction as well as their credit rating upgrade both are positively going to help Suzlon in interest cost reduction per se and they are working on that direction to optimize their cost. The company does not want to replace 3.3% annual cost debt from foreign currency torupee now. The company has a mandatory conversion feature in their convertible bonds. Suzlon achieved a milestone of 10,000MW of installed capacity making them the largest renewable energy company in India. Today India’s the total installed base is 28 GW by that way India is the fourth largest country in the global market and India has to deliver 32 GW to achieve by 2022 of the 60 GW that they target. Indian market will continue to grow by nearly 15% in the next financial year Indian market. Order intake for this quarter is 557 MW taking their nine months’ order intake over 1 GW. Order book as on date stands at 1,231 MW, which is valued at Rs. 7,523 crores. Consolidated net term date excluding FCCB now stands at Rs. 6,538 crores. Their R&D efforts are focused on bringing down the levelized cost of energy by 25% in the next five years. They plan to use integrated technology and offer a wind-solar hybrid solution, which will lead to the more efficient utilization of the grid and other resource.